Water Soluble Polymer Market Size was valued over USD 24 billion in 2016, and the industry will grow at a CAGR of upto 5.6% up to 2024. Water treatment industry is increasing at a significant rate, due to the increasing potable water demand in across all nations. It is further triggering the wastewater treatment demand across industrial, and municipal processes, which would require more products such as water soluble polymers. The tightening environmental regulations in developing economies regarding effluent discharge from manufacturing companies and drinking water purity are further accelerating the demand for these products, and will further enhance the global water soluble polymer market size over the forecast period. Companies involved in production of pharmaceuticals, nutraceuticals, mineral processing, oil & gas, and paper generate high volumes of effluents. Besides, the wastewater generated from oil & gas companies are carcinogenic, and sometimes toxic. This enormous generation is restricted with strict regulations on their disposal, will further demand more waste treatment products, giving a significant boost to the water soluble polymer market growth. Oil & gas industry acts as one of the prominent consumers of these commodities. The hydrates formation in the oil & gas pipelines has become a major challenge in oil & gas operations. These are highly employed in pipelines in order to reduce hydrate formation. The rising crude oil production in the world will further trigger the global water soluble polymers market size by 2024. Product consumption will grow over the coming years due to their growing demand in the developing nations. These countries are completely focusing on employing eco-friendly products, as they help in restricting the pollution levels. Favorable government regulations in these economies will further assist in increasing product demand, thus propelling the industry growth. Water soluble polymer market could face restraints due to the adverse environmental, and health impact of synthetic polymers. These products may affect the personals and the environment in various direct or indirect ways. This market may be further affected due to instability in raw material prices of synthetically derived products from the past few years. Over the coming years, the raw material prices are expected to oscillate highly, which in turn may show a negative impact on its growth. 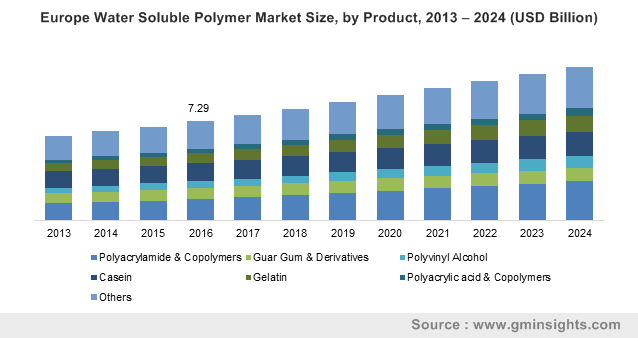 The polyacrylamide & copolymers segment accounted for a revenue of over USD 5 billion in 2016 and the segment is likely to exhibit promising gains over the forecast timeframe due to prevalence of stringent government regulations to reduce the release of harmful agents into the environment. This has been extensively used as an effective coagulant and flocculant, owing to its properties such as good thermal stability, high miscibility, solubility, and nontoxic nature, and so forth for separating all kinds of suspended solid particles present in industrial liquid effluents. Water soluble polymer market size for water treatment lead the application base in 2016 and accounted for approximately 25% of the total business share. Increasing demand for effluent treatment is majorly driving the growth of this segment. Rising effluent generation from the manufacturing companies is creating a huge demand for water treatment processes, which in turn accelerating this segment. Over the future years, the demand for potable water is going to rise and drive towards growth over the forecast period. Asia Pacific holds the major share of global water soluble polymer market, with a share of over 30% in 2016. Increasing industrialization, coupled with the favorable industrial regulations in developing economies of this region are creating an enormous growth avenue for manufacturing companies, which is leading to massive wastewater generation. The stringent regulations regarding industrial effluents disposal are creating a high demand for wastewater treatment processes, thereby driving the water soluble polymer market size by 2024. North America will witness a sluggish growth, owing to a highly matured market in this region. In 2016. Europe will also witness a moderate CAGR close to 5%. However, tightening regulations regarding wastewater treatment plays a vital role in driving the water soluble polymer market. Prominent players operating in this water soluble polymer market include BASF SE, SNF SAS, Ashland Inc, Arkema S.A., Kemira OYJ, Kuraray Group, E. I. du Pont de Nemours and Company, The Dow Chemical Company, Nitta Gelatin Inc. and LG Chem Ltd. In global water soluble polymer market, these companies have their unique product applications in various verticals such as water treatment, petroleum, detergents & household products, paper making, and oil & gas. 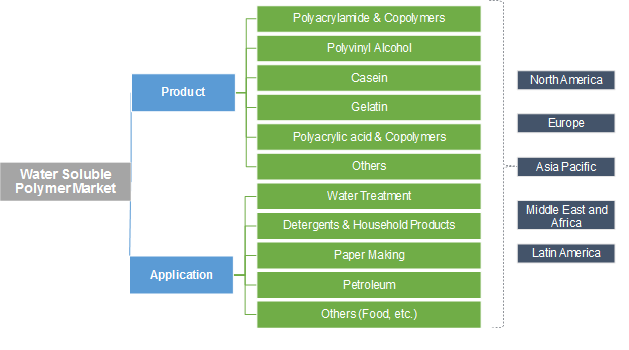 Water soluble polymers are derivatives of both natural and synthetic raw materials. The global market is determined to be highly attractive, as this polymer product has extensive applications in various applications such as oil & gas, wastewater treatment, pharmaceutical, paper production, etc. Extensive research activities will further implement product demand across niche applications such as drug delivery systems and food.